In my life, ice cream is a year-round activity, from shivering over cones in the rain to ice cream sandwiches in the spring to cranberry gelato for the holidays. But when summer comes around, the hobby turns into full-fledged obsession, and at least once a week we roll home, round and sated. This year, I was determined to do my old favorites justice while finally making it to a few new spots that recently popped up. As July hits, I am proud to announce that we are officially pacing ahead of goal, with a nearly permanent sugar headache, and might just have to up the stakes again... anyone free Friday? The original Park Slope location was an occasional detour for us, picking up pints amidst strollers to take home and savor. 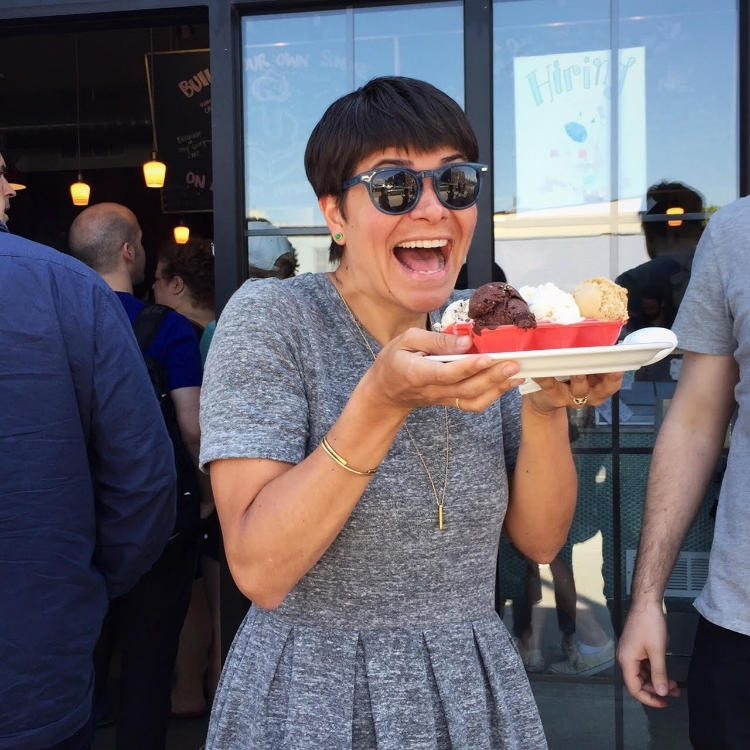 But with the launch of their giant Gowanus space--complete with a roofdeck outfitted in twinkling lights and lounge chairs--Ample Hills upped its game. You will still need to wade through shrieking, sticky children at nearly all hours, and birthday parties abound, but if you can survive it, the ice cream is rich as can be, redolent of earlier-era Ben & Jerry's. For those who can stomach sugar on sugar, the Ooey Gooey Butter Cake is infamous, as is the Rice Krispie take. I tend to lean towards the coffee, made with Stumptown and flecked with toffee, the pistachio with crisp chunks of brittle, the impressive cookies and cream... or like last night, the clean mint studded with large pieces of dark chocolate peppermint patties. Morgenstern's, dare I say it, might be the place I was most excited to explore this year. It was one of those names that felt like it was constantly coming up--whispered about in an article over there, murmurs over here. And what I gathered was that it had the perfect combination of old fashioned parlor and modern flavors, without losing the integrity of being a lower east side ice cream shop. And so Sister and I took an outing to taste the goods and dear God we have dreamed of it every night since. Be warned: the lines were immense and the register man strictly enforcing a one-taste rule, at least at that peak hour. Craning over the crowds ahead, we dissolved into a panicked debate of vietnamese coffee vs. bourbon vanilla vs cardamom lemon jam and oh god they have Durian too? This was to say nothing of the toppings which threw us into another tizzy: pickled pineapple? chocolate shots? aleppo pecans? All I can say is: sesame caramel sauce. And don't worry--you can always go back the next day. Big Gay Ice Cream features soft-serve, which I am well aware is not ice cream, but a whole separate category. The thing is, it's really, really good soft-serve in ways that you've never had it. While the category is not one I thought ever needed fixing (because, let's face it, a McDonald's sundae is one of the biggest pleasures in life), it turns out you can take it to a whole new level. Between the rainbow-and-unicorn decor (pro tip: their swag makes awesome gifts for out-of-towners), cheeky names, and insane quality, Big Gay might be one of my favorite places in NY. Get the Saltie Pimp, with dulce de leche and chocolate dip, or the Monday Sundae with a nutella lined cone, sea salt and twist. Neither snow nor rain nor hordes of teenage girls stays these warriors from their sweet nutella… though they may prevent fully effective photography. milkmade is sheer brilliance. as a company, its primary focus has been a mail-order service: two pints per month delivered to your door via subscription. If that's not fat-kid-genius, I don't know what is. But for those that flinch at knowingly spending $30 per month on their fix, this summer they finally launched a brick and mortar in the old Hay Rosie space in Cobble Hill. For more summer requirements, see the official 2015 checklist here.